I saw a poster on TIGSource talk about manually cutting up sprite sheets, so I’ve dusted off a project from 2007 to solve it. 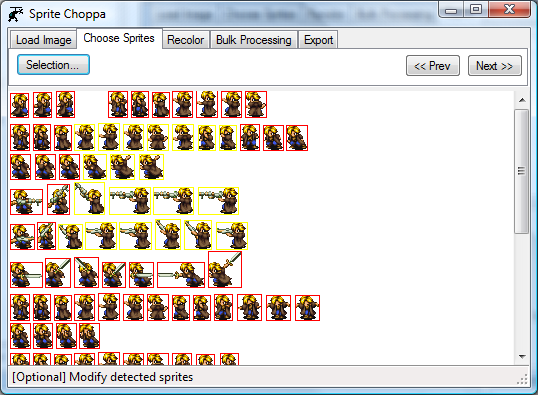 Just load up a sprite sheet, select the background color, and export the results into a directory. It’s got a few extra features useful for what I originally wanted it for, too. Just remember, this is from the archive, so way crappier than the stuff I do nowadays. I’ve barely touched it, except to brush off a few GUI bugs and delete menu options that don’t do anything. You can select multiple transparent colors with CTRL. To deal with tile sets, right click on the detected sprite and select “Split” to produce neatly cut squares. Recoloring is very tedious, except when the same example sprite has been provided in different palettes, then you can “Use Sprite” to copy the palette from one to the other. I doubt that “bulk processing” is useful to anyone, just forget about it.